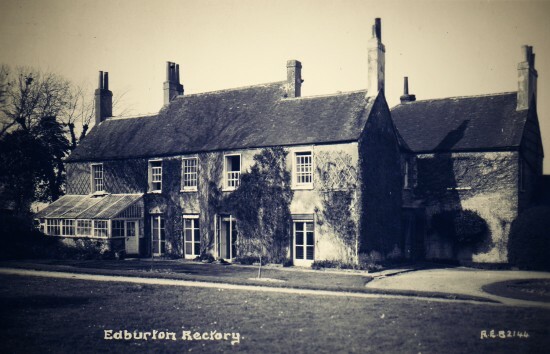 A postcard showing Edburton Rectory as it was in the early 1900s. C18. Two storeys. Four windows. Faced with roughcast. Tiled roof. Glazing bars intact. The rectory appears to be eighteenth century. If any part of an older building is incorporated, it cannot be much for George Keith (Rector 1705-1716) complained of the rectory as “old and crazy and low”; about the year 1710, when he was ill in bed, the wall against which it stood gave way and tumbled into the garden, drawing the bed and its occupant halfway through the breach. This event, and the heavy timbering of the attics may be pointers to an early date in the eighteenth century for the present building. 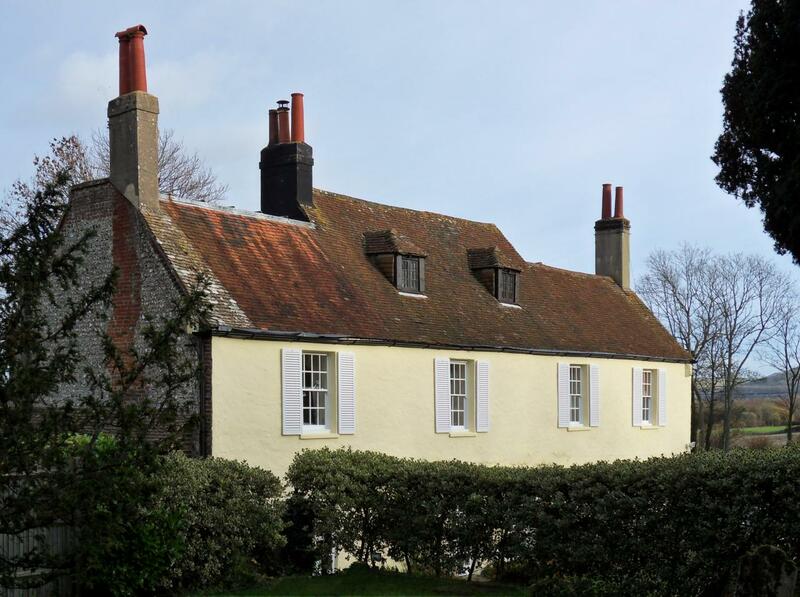 Subsequent alterations were the adding of a range of stables at the east end by Charles Baker (Rector 1754-1784), which survive except for the coachman’s cottage, and which replaced others farther from the house. Early in the nineteenth century some internal replanning, including the substitution of the present meagre entrance on the east side for one on the south front were made. In 1868, the patch of grassland south of the old east approach to the churchyard was exchanged for crownland north of the church. The Reverend Francis Gell (Rector 1884-1891) dignified this approach, which now ran within his garden, by the erection of the lych gate. Today, the oldest part of the building is the wall at the west end, which dates back to 1664. At one time the house had five hearths. After the 1710 collapse noted by Howe, the house was reconstructed in stages during the 1700s and 1800s. First, the roof level of the central section was raised and a little later, between 1754 and 1782, a good-sized room and hall, plus an additional stable were constructed. In the 1800s the main entrance was moved from the south side of the building to the east side and an extension was added to the west end. This included a stairwell, which seems to have been added partly to allow access for pupils attending classes being given by the then Rector. Finally, a kitchen wing was added. A model railway ran round the grounds of the rectory garden between 1939 and 1945 when Robert Westall was the incumbent and there is some evidence that this layout, or one similar to it, thought to have belonged to a friend of a previous rector, may have been in place from as early as 1924. As far as local residents can recall, it was between a 3″ and a 5″ gauge and electrically driven. The track was supported on piers and ran on a low platform through the garage, where the rolling stock was stored and there was another, smaller, model railway layout in the house itself. Reverend Westhall also had a printing press and was a very competent typesetter. He thus produced the Parish magazine and other church notices himself. He and his family owned a pony and trap and he used this when visiting sick parishioners, often bringing them new laid eggs and items of food (rationing had started in January 1940). Unsurprisingly, Reverend Westall was a popular member of the local community. In the 1950s, the combined effects of poor management and the Church of England’s losses on the stock market meant that St. Andrew’s and its associated buildings, which included the rectory, became dilapidated. No rector was appointed to St. Andrew’s — there was just a ‘priest in charge’. 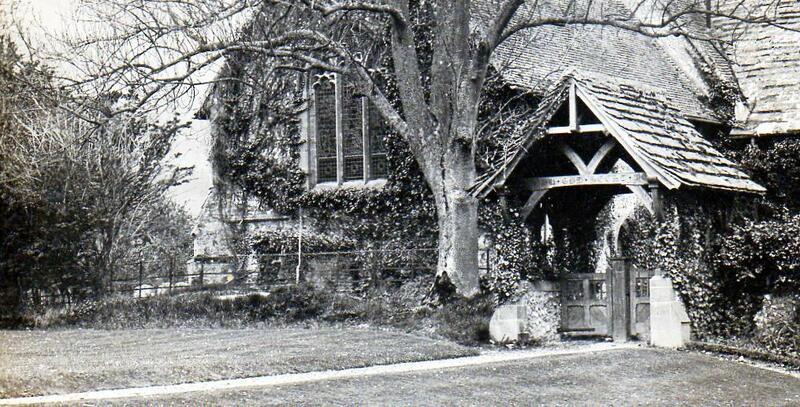 To prevent the situation becoming any worse, the parishes of Edburton and Poynings were amalgamated in 1957 and John Francis Cornish was appointed as Rector of Edburton and Poynings, a post he held for 22 years. He lived at The Rectory in Poynings. Edburton Rectory, also known as ‘The Vicarage’, was sold in the same year and became a private house. The first private owner was Frederick Henry Hillson, who was the proprietor of several newsagents in Brighton and Hove. He commissioned a builder to carry out a considerable amount of repair work and during this time a vertical beam that ran from top to bottom of the house was discovered. A specialist surveyor dated this back to the twelfth century. However, today this is once again concealed within the fabric of the building. In 1962, the house was purchased by Teddy Hales and his American wife Anne. Teddy Hales worked as an Inspector of Schools and was influential in getting world history included in the secondary school syllabus. He was also an historian of the catholic church and published half a dozen books in that area between 1954 and 1965. Like the Reverend Westall, Teddy was a model railway enthusiast and he set about improving the train layout, adding tunnels, viaducts, signals and a station. He eventually modified it to the point where, by removing pieces of glass from an exterior wall, he was able to operate the trains around the garden and through the house, from his office desk. For wet days, he also had a 0-gauge layout, which ran around the upper floor, connected via small holes cut through the walls of each room. Teddy Hales died in Italy in 1986 and the former rectory was sold. The new owner commissioned further extensive repairs and landscaped the grounds. The path leading to the lych gate entrance to the church is no longer used and, since the house was connected to the mains water supply in 1964, two of three wells in the grounds are also no longer in use. The third is retained in service for watering the garden. F.A. Howe (1958) A Chronicle of Edburton and Fulking in the County of Sussex. Crawley: Hubners Ltd, page 33.